My bestest friend from before we could even talk, Erin and I like to frequent the latest trendy places to eat (as of late--Megu Tribeca, Tao, Dos Caminos). We also like to go to Saint Marks Place or Nolita for late night grub (nothing like a bowl of soup noodles, chicken-don, and bibimbap to end a night of happy drunkenness) like Kenka and Jup She. She's the one who introduced me to the French macaron (and I haven't been able to stop thanking her since with boxes of macarons from all over Manhattan). A year or so ago, we tried to make French macarons from scratch, which was pretty much a complete and utter disaster, but we had fun anyway! We've been morsel marauders all our lives (she's my Taco Bell compadre for life, but nobody is supposed to know we're regulars there, so shhh! ), and I look forward to more (mis)adventures with her! Thanks again for participating, Erin! Love ya! 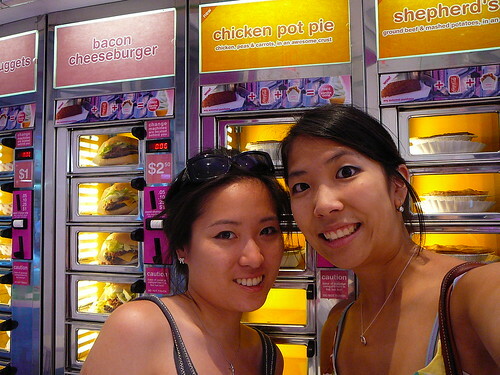 Erin and me at Bamn!, a now-closed retro automat located at Saint Marks Place. I keep it classy: Starbucks cinnamon dolce lattés, cosmopolitan martinis, and of course my choice beer, a nice cold Corona. STARBUCKS LATTÉS, but I doubt it's much of a secret anymore. I go everyday. My mom makes this great dish with tomato, steak, egg... I always crave it when I'm home, and of course, it goes amazing with my favorite food I cannot live without: white rice. I'm pretty easy to please, anything with steak, egg or rice will most likely satisfy me. I had really fabulous foie gras in Paris, in the Montparnasse area... the way the foie gras melted in my mouth is nothing like it is in the United States. There are some neighborhood gems here which serve awesome foie gras, but nothing beats the real deal in Paris. mushrooms, things with teeth, peanut butter, and scallion in my soup noodles. This is a hard one... it's a rock-paper-scissors situation between apple strudels, crème brûlée, and soufflés.